The following exposes the key-data in the Climate Debt calculations: Fossil CO2 Emissions, GDP, Environmental Performance, Ecological Footprint without carbon, Forest Cover, Primary Forests, Population trends and climate change financing. For comparison, Greece, Chile and Turkmenistan (ranked 40th, 41st, and 42nd in Share of global Climate Debt) are included in some diagrams. 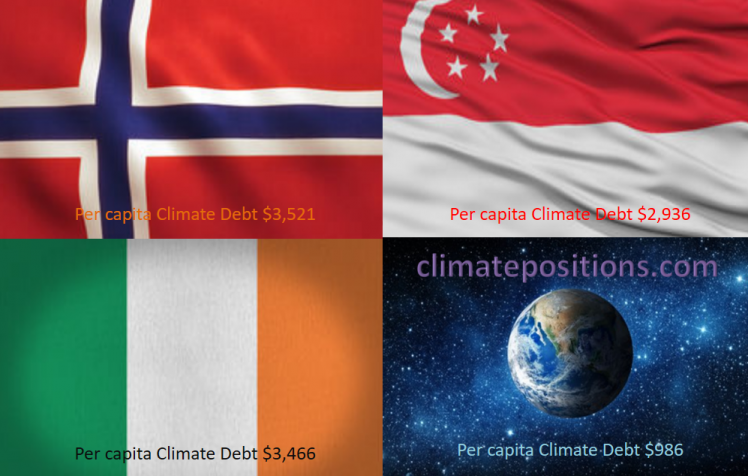 The ‘Per capita Climate Debt‘ accumulated since 2000 of Norway, Ireland and Singapore are $3,521, $3,466 and $2,936, respectively. 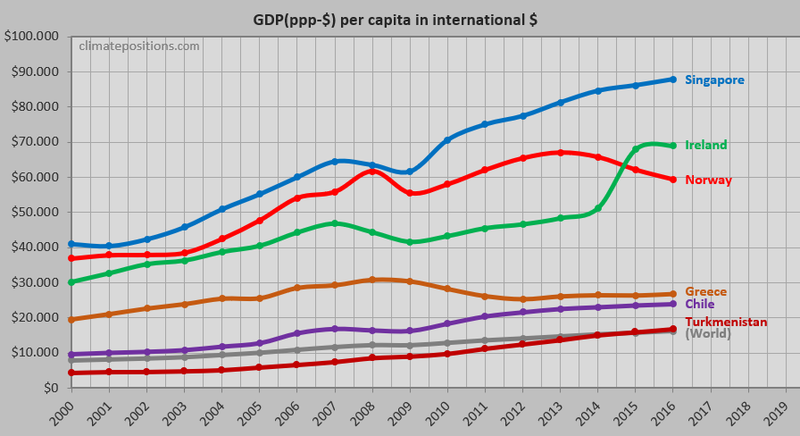 The second diagram shows the trends between 2010 and 2017, with world average set at 100, for the three countries as well as of Greece, Chile and Turkmenistan. The per capita Climate Debt ranking by October 2017 is shown in brackets. 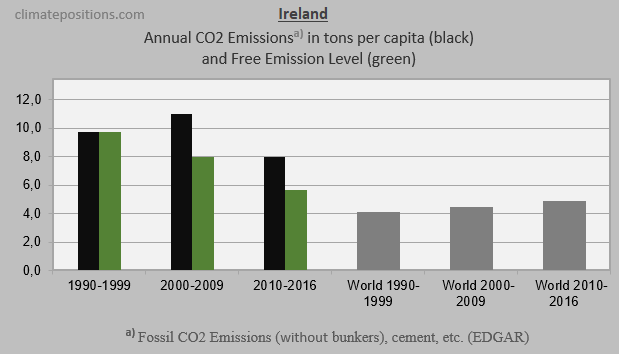 The next three diagrams show Fossil CO2 Emissions from fuels and industrial processes¹, in tons per capita in decades, of Norway, Ireland and Singapore. 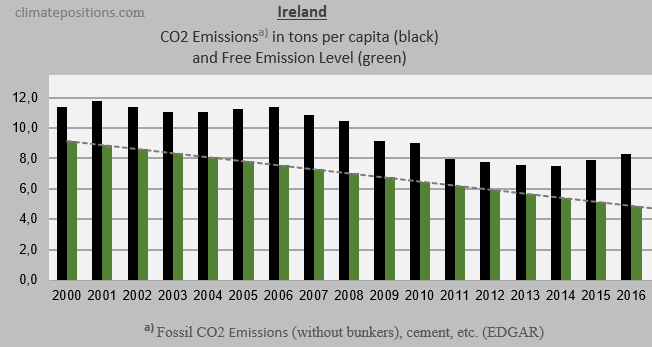 The green bars show the Free Emission Level² – the exceedance is the basis for calculating the national Climate Debt. The grey bars are World emissions average. 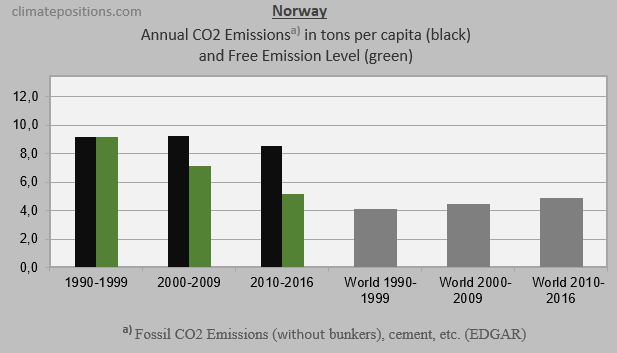 The three diagrams below show the per capita Fossil CO2 Emissions from fuels and industrial processes¹, annually since 2000, of the three countries. 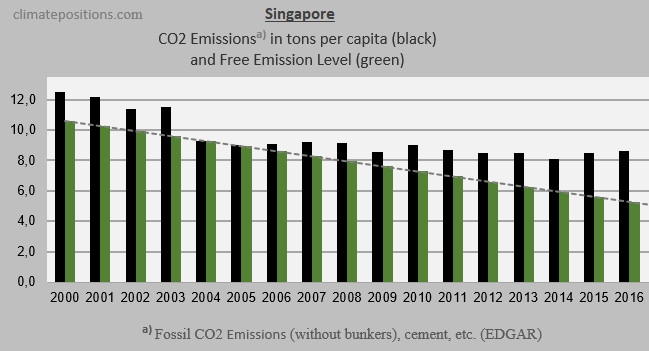 The green bars show the Free Emission Level². 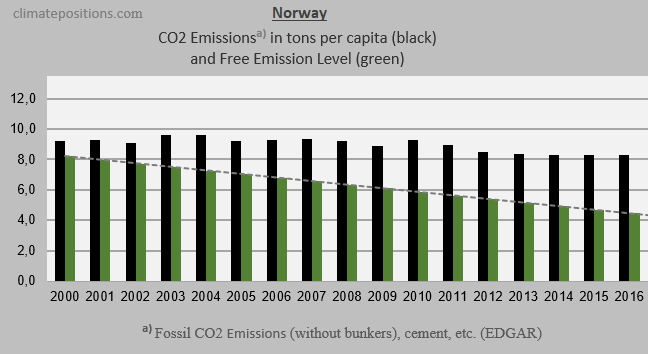 The impressive Irish reductions between 2007 and 2014 are insufficient all in all, while Norway’s only (small) reductions are between 2011 and 2014. 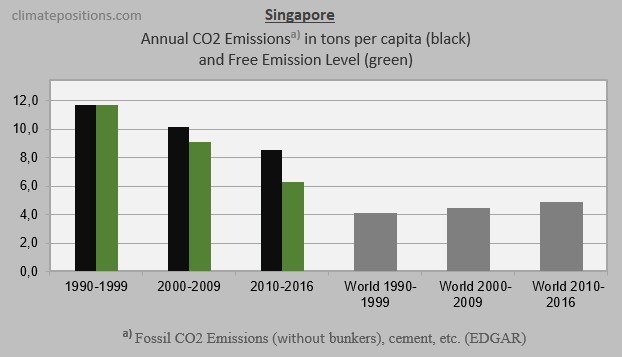 Singapore’s substantial 2004-reduction appears to be a single event. The diagram below shows per capita GDP(ppp-$) of the six countries and the World average. The wealth of Singapore is around 5.4 times greater than World average. Wealthy Ireland and wealthy Norway swapped positions over a three-year period. 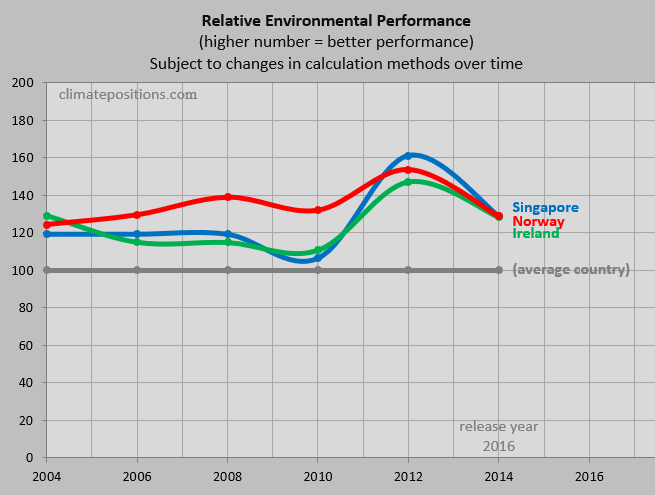 The average per capita Ecological Footprint without carbon, between 2000 and 2013, with an average World country set at 100, of Norway, Ireland and Singapore are 249, 157 and 107, respectively. Release years are about four years after data years. Norway’s Climate Debt would have been reduced by 11.6% with World average footprint. Note that footprint calculation methods have changed over time. The latest and historic details from the source are available here: ‘Norway‘, ‘Ireland‘ and ‘Singapore‘. 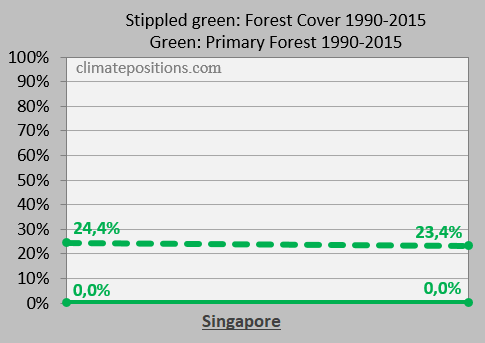 Forest Cover and the precious Primary Forests as percentage of total land area, in 1990 and 2015, are important indicators in ClimatePositions. 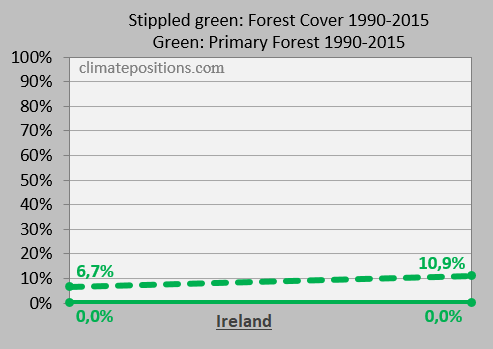 The Irish Forest Cover grew by 4.2% of total land area (the Climate Debt would have been 11.2% larger with unchanged Forest Cover). 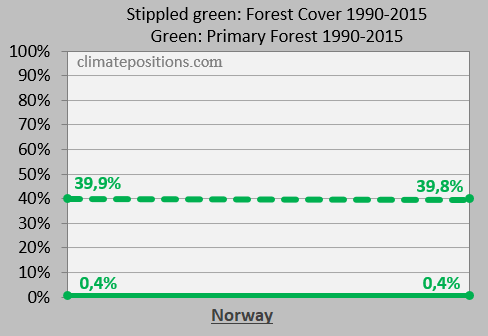 Primary Forests of all three countries are zero or negligible (Norway). The diagrams below show Population density 2016 and growth between 2000 and 2016. Singapore’s extreme density is second highest in the World, after Macao. The Populations of Norway, Ireland and Singapore are about 5.2, 4.8 and 5.6 million, respectively. 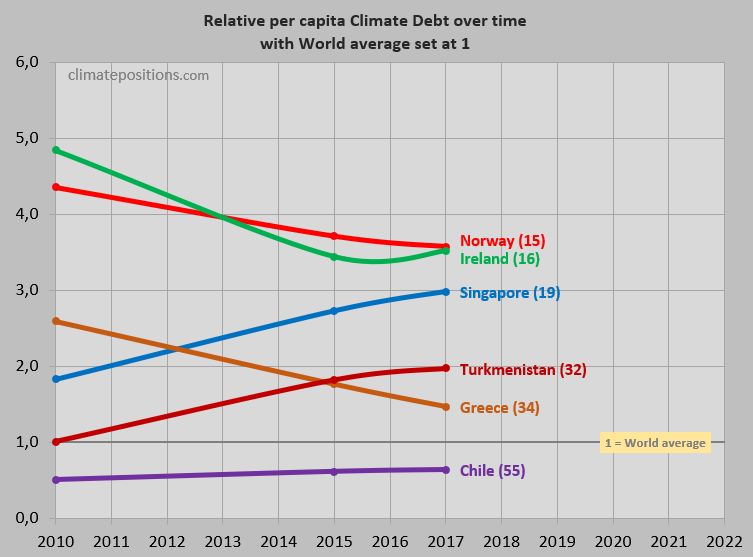 Finally, the table below shows four key values of Norway, Ireland, Singapore, Greece, Chile and Turkmenistan in the calculation of national Climate Debts in ClimatePositions. The price of CO2 per ton (column two) is for total CO2 Emission from Fossil Fuels (without bunkers) and industrial processes. Climate change financing (column three) is from July 2017.